Hello friends, At present time most of the mobile manufacturer companies launch budgeted smartphone which comes with different great features and latest technology. Now, Samsung company launched his latest Samsung Galaxy Note 3 Neo smartphone comes with 5.5-inch Super AMOLED capacitive touchscreen with 16M colors which provide 720 x 1280 pixels resolution and density is 267ppi pixels with TouchWiz UI skin. This smartphone is available in the the Indian market at estimated price is Rs. 38,990 only. Samsung Galaxy Note 3 Neo is running on the Android OS v4.3 (Jelly Bean) which is upgradable to v 4.4.2 KitKat operating system. It is powered by Hexa Core (1.3 GHz Quad-core Cortex A7 + 1.7 GHz Cortex A15 dual-core) Processor and 2 GB RAM. Samsung Galaxy Note 3 Neo Powered by Hexa Core (1.3 GHz Quad-core Cortex A7 + 1.7 GHz Cortex A15 dual-core). It has a powerful processor. It has Qualcomm MSM8228 Snapdragon chipset. It has 2GB RAM With 16GB ROM and user can be expanded memory up to 32GB via SD Card. Samsung Galaxy Note 3 Neo comes with Super AMOLED 5.5-inch capacitive touchscreen with 1920 x 1080 pixels Resolution. It has 8MP Rear Camera with LED flash, 3264 x 2448 pixels, Auto-focus and 2 MP Front Facing camera. 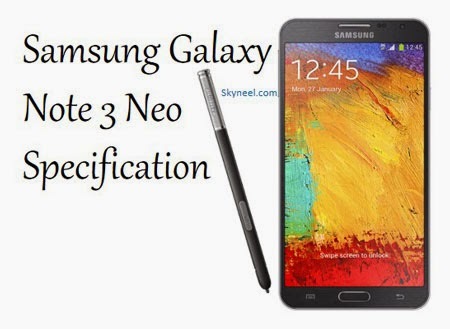 Samsung Galaxy Note 3 Neo is a stylish phone, it has 148.4 x 77.4 x 8.6 mm, dimensions and phone weight is 162.5g. Galaxy Note Neo 3 runs on 4.3 Android jelly bean. The Smartphone has a compass, Accelerometer, proximity and Maps, Calendar, Google Search, Gmail, YouTube, Google Talk, Alarm, Calculator, Clock, and other Google sync apps. This is power pack with loaded lots of features and apps. Samsung Galaxy Note 3 Neo has 2G and 3G network. It has Wi-Fi, Bluetooth, GPRS and EGPRS or EDGE, and Bluetooth with 3100mAh Li-Ion battery. 1. It has good processor and Lots of Ram 2GB. 2. It has 5.5-inch Screen with Super AMOLED capacitive touch. 3. It runs on latest Android version 4.3 Jelly bean. 4. It has Ultra Slim 8.6mm (Average 9.7mm) Phone. 5. It has Accelerometer, gyro, proximity, and compass.